Our grandmothers were right all along – carrots do help us to see in the dark. 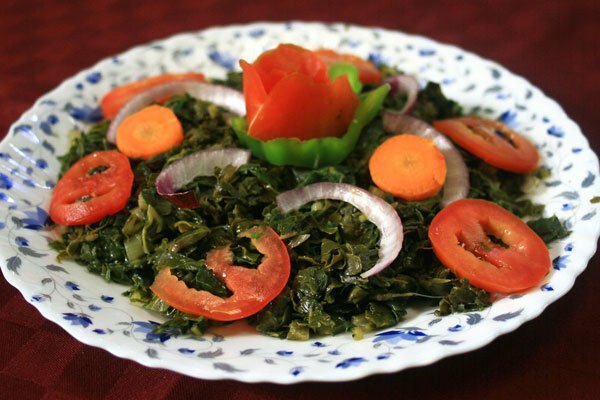 But nowadays there’s another everyday food that’s grabbing the headlines for eye health: kale (sukuma wiki). It is believed that eating kale between two and four times a week may lower the risk of age-related blindness and developing cataracts. And starting young can make all the difference. How can something as simple as kale be so good for you? Kale and other collard greens are rich in two yellow pigments called lutein and zeaxanthin, both of which are capable of absorbing blue light. It is blue light in the sun’s rays that is most damaging to an area at the back of the eye called the macula, a very sensitive part of the retina which, when damaged by exposure to sunlight, can result in macular degeneration. According to a paper published by Dr Johanna Seddon of Harvard University in The Journal of the American Medical Association, those who ate kale and collard greens every day reduced the risk of macular degeneration by whopping 57 per cent. Needless to say, protecting our children’s eyes with these simple nutrients is paramount. Even in those who have problems, a daily helping may even help to reverse some degeneration. Of all the collard greens, kale is the best source of lutein, giving us a fantastic 22 mg per 100 g serving (the studies were using amounts of just 6mg of lutein a day). Spinach, spring greens and watercress are also a rich source, containing 13 mg. The two pigments found in these vegetables act almost like internal sunglasses and as well as protecting against age-related blindness, they can make a difference to more subtle measures of vision like glare. Other important foods for eye health include fish for dry, gritty eyes and beta-carotene rich foods (carrots, sweet potatoes, mangoes) to help eyes adapt to dim light. What other nutrients can contribute to better eye health? For one, increase your increase of lycopene (the red pigment in tomatoes, watermelon and red grapefruit) to reduce your risk of developing cataracts. DHA (docosahexaenoic acid), one of the essential fats in oily fish like salmon and tuna, also help (these omega 3 fats are also great in helping to prevent dry eyes). I would also suggest cutting down on the foods that can damage their eyes, such as saturated and trans-fats (found in many processed foods and margarines), since they can cause hardening of the blood vessels, including those supplying oxygen and nutrients to the eyes.